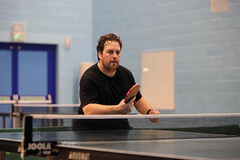 New Milton Table Tennis Club | Home of New Milton TTC on the web! First of all I would like to welcome you and say thank you to everyone for coming to our Christmas Party tonight. I would also like to thank Lynn for organising this event on our behalf. The previous Christmas Party was held exactly a year ago on the 15th December. The last twelve months have been a mixture of sadness and some success for our club. We were saddened to learn of the death of Mrs Sue Daish in August. All seven of Sue’s children had been playing members of the New Milton Table Tennis Club from about 1995 until the present day. Sue regularly transported the children to our various club night activities from their house in Lymington to our club venues at Mudeford Wood, the Grange School and Sway Village Hall. Several current and former club members were among those who attended the funeral at St. Thomas’s Church, Lymington on the 31st August. We were also sorry to learn of the death of Malcolm Elliott in January. 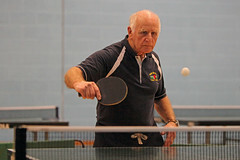 Malcolm played league table tennis for New Milton TTC for 55 years up to the end of the 2010/2011 season when he retired from the sport. The first time that Malcolm played for New Milton was during the 1955/56 Season. Turning to the activities of the New Milton Table Tennis Club. 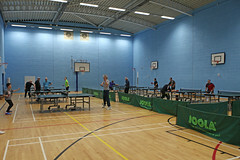 Mudeford Wood Community Centre has been our primary table tennis venue since 2004. We are in our fifth season at the Grange School, Christchurch. Attendances continue to hold up well at the Sunday night club sessions. We frequently have guest visitors from other local clubs who come from as far away as Broadstone. I am pleased to report that at the conclusion of the 2017/2018 season two teams, New Milton G and L both won promotion to the 2nd and 4th Divisions having secured the “Runners-Up” spot in Divisions 3 and 5 respectively; In the Times & Directory Handicap competition New Milton J won the Final of the T & D Cup event and New Milton M were “Runners-Up” in the Final of the T & D Plate. In the BDTTA Individual Tournaments held during March New Milton players won six titles and were the runners-up in a further singles event. Brian Bickell won all four veteran’s titles for which he received a standing ovation at the BDTTA Presentation Evening in May. Sadly Brian is unable to be with us tonight as he is playing in a Veteran’s Tournament this weekend. New Milton TTC was only able to enter 10 teams in the Bournemouth League this season because of a continuing problem with injuries although we have 51 registered players. At this point in the season the highest placed team is New Milton H who are in 3rd place in Division 4. At the start of the current season The Bournemouth & District Table Tennis Association reduced the number of divisions from six to five. Three of the divisions (1, 2 & 4) contain 11 teams each, the Premier contains 10 teams and Division 3 contains 12 teams. Club Chairman, Steve Hemmings had to stand down from the Committee in January because of health issues. Steve oversaw the migration of the New Milton Table Tennis Club from Sway Village Hall and Arnewood School to the Grange in 2014 achieved with minimal disruption to our club night activities. Steve successfully negotiated the terms of the new lease. 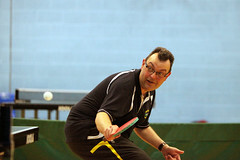 I am pleased to report that Steve has recovered and has returned to playing table tennis in the Premier Division. Club Treasurer Malcolm Floyd stood down from the committee at the 2018 Annual General Meeting after over 12 years’ service in that role. Malcolm afforded me considerable support by recording the minutes of our regular committee meetings. We will miss his weekly report of our club’s activities in the New Milton Advertiser and his postings on the New Milton TTC web site. A few years ago Malcolm was jointly awarded the “Press Officer of the Year” Award by the ETTA. In the spring of 2017 Malcolm undertook a considerable amount of work to enable the club to achieve its present ClubMark rating. I was honoured and proud to be nominated by Malcolm to receive the prestigious Torch Trophy Trust Award for Outstanding Service to Sport, presented by HRH the Duke of Gloucester. The Awards Ceremony was held on the 7th March and took place at the Army and Navy Club, Pall Mall, London SW1. I was accompanied to the ceremony by Malcolm, Shaun and Simon Golding, who kindly arranged the transport. My citation was read out by Sir Trevor Brooking, CBE, former England and West Ham player and the award presented by the HRH Duke of Gloucester. There were 21 recipients who were successfully nominated for this award in both able bodied and disability sports. Each recipient received a handbook, a certificate signed by Sir Bobby Charlton, CBE and Paul Dimond, CBE together with an engraved glass trophy contained in a blue presentation box. It was a wonderful and memorable day. We have entered two teams in the Dorset Pairs League. This event is played at the Grange School venue on Wednesday evenings. It only remains for me to wish everybody a happy and peaceful Christmas and extend my best wishes for the New Year. 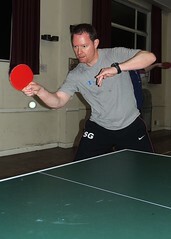 New Milton Table Tennis Club’s annual closed tournaments culminated in their Grand Finals Night at the Grange School, Somerford on Thursday 14th June in front of a small but appreciative crowd. First up was the Ladies Handicap Singles Final, which was the one and only match in this event as there were only two entrants, Sylvia Smith and Lynn Willrich. Willrich was out for revenge as she lost to Smith in last year’s final and was determined to capitalise on her +5 start. She came out with all guns blazing but Smith caught up at 15-15 only for her to fade and lose it 19-21. Willrich really started to believe and carried on with her outright attack to win the second 21-17 to reclaim her trophy from two years ago. Next up was the Under 40s Handicap Singles between Kai Major and Michael Kominek. Kominek had a +10 start and completely overwhelmed Major to take the first set 21-6. Major recovered some composure to take the second 21-16, but Kominek wasn’t having any more of that and took the decider 8-21. The Over 40s Handicap Singles was the first of the two finals between Stuart Burton and Plamen Petrov. Burton had a start of +11 but Petrov’s clever combination play proved too much for him and won it 21-19, 21-17. To give Burton and Petrov a break between their next contest in the Handicap Singles Final, an Exhibition Match was staged between Matt Daish and Jack Trafford. This was a repeat of the Junior Singles Final which was held earlier on 10th May and the same outcome with Daish winning in two straight sets. Club members don’t often get the chance to see 17 year old Daish in action these days as he now plays in the German league. Next season he will playing in the Oberliga having recently signed for TTG Neckarbischofsheim based near Stuttgart. Trafford was voted the club’s joint most improved player last season and achieved an impressive 65% winning average in his first season in the Premier of the Bournemouth & District league. The Handicap Singles Final had an air of inevitability about it as Petrov once again proved too much for Burton and won it again in two straight sets, 21-15, 21-17. Petrov (pictured below) was looking for his third title of the evening as he and Sid Daynes took on Krzysztof Skwarek & John Parkhouse in the Doubles Final. Petrov and Daynes seemed to gel better than their opponents, and benefiting from a small +3 start they won it 21-14, 21-18. Petrov looked like landing his fourth title as he won the first two sets against 15 year old Jack Trafford in the Open Singles Final 11-8, 11-6, mainly by effectively blocking Trafford’s forehand loops. However, the teenager sneaked the third set 12-10 and then the fourth more convincingly at 11-6 to set up the decider. Trafford was determined not to let Petrov back in the game, and with much more varied serves and attacking strokes he won it decisively 11-3. Thanks to Club Secretary & Tournament Organiser Bev Scott-Johns for yet another set of very well organised tournaments. Bev is a Table Tennis England qualified Tournament Organiser and County Umpire; both skills being very much in evidence during the tournaments. Members and guests of the New Milton Table Tennis Club attended the recent Annual Presentation Evening of the Bournemouth and District Table Tennis Association, and witnessed a procession of club members going to the front to collect their trophies. The presentations were made by Guest of Honour Tony Clayton, who is President of the Dorset Table Tennis Association and former England International. One of Tony’s great claims to fame was being in the England team which visited China during the so-called “Ping Pong Diplomacy” episode in 1971. First up for New Milton, Club Secretary Bev Scott-Johns collected the League Division 5 team runners-up trophies on behalf of Mike Melaniphy’s L team, none of whom were able to attend the event. Next up were Terry Jenvey (captain) and Rob Fagan from the G team to pick up their Division 3 league runners-up trophies. The Gees led the way for most of the season, but were pipped to the post by one point by winners Bournemouth Sports K. It wasn’t long before Jenvey had to return to the front to pick up his Division 3 Individuals runner-up trophy. Stuart Burton (captain) and Taki Hall were there to represent the M team who came runners-up in the Times and Directory Handicap Plate, and the J team’s Mike Roberts (captain), John Parkhouse, Plamen Petrov and Adam Titcombe were on hand to collect their Times & Directory Handicap Cup winners tophies. Taki Hall had to return to the front to collect her Division 5 Individuals winners trophy from her first ever appearance in the tournaments, and 15 year old Jack Trafford picked up the Under 15s winners trophy for the second year running. Club Veteran Brian Bickell (pictured below with Tony Clayton) improved on last year’s haul of the Vets 60+ and Vets 70+ titles by adding the Vets 40+ and Vets 50+ titles to his belt, the first time that all four Vets titles have been won by one individual. To spare our hero’s legs, he was told to stay at the front rather than make three return trips. People were scratching their heads as to whether or not any player had won the David Woodcock Trophy for Most Improved Player on more than one occasion, but this distinction certainly fell to 17 year old Kai Major, who previously won it in the 2014/2015 season. Kai (pictured below) returned to table tennis after courageously battling Hodgkin’s Lymphoma, for which he underwent chemotherapy and radiotherapy at Southampton Paediatric Oncology Unit. He was classed as being in remission in January 2017 and has made an enthusiastic and successful return to the sport, gaining a 50% winning average in his first season in the Premier, winning a couple of hat-tricks in the process. New Milton Club Secretary Bev Scott-Johns continued to receive plaudits after receiving a prestigious Torch Trophy Trust Award for Outstanding Service to Sport back in March. This accolade had pride of place in the Bournemouth Association’s newsletter which was available at the presentation dinner. Bev was very proud to receive the award from HRH the Duke of Gloucester at the 55th Annual Torch Trophy Trust Awards ceremony at the Army and Navy Club, Pall Mall, London, his citation having been read out by West Ham and England football legend Sir Trevor Brooking CBE. PLATE DISAPPOINTMENT FOR NEW MILTON M! With the New Milton J team winning the Annual Times and Directory Handicap Cup Final the previous week, the New Milton Table Tennis Club were hoping for a Times and Directory double as their M team made it through to the Plate final. Milton got off to a promising start however as Captain Burton, benefiting from a +7 start beat fellow captain White in two straight sets. Next up, Ms Hall took on White’s daughter Marina Scott and really struggled with Scott’s +6 start and lost in two straight sets 13-21, 14-21. The third match saw Brown overcome a 7 deficit to win her first set against Kelly, but lost the next two 12-21, 19-21 for the Bourne to take the lead. Bournemouth were clearly on a roll and won the next two matches, with Milton’s Hall needing to beat Kelly to stay in the Plate. Once again, Hall was on the wrong side of the handcapping, this time giving away a +6 start to Kelly. Kelly used her start intelligently and positively and blew Hall away in the first set 21-9. Hall did incredibly well to gradually eat away at the handicap in the second set, only to narrowly lose it 18-21. That was it, 5-1 to the Bourne to get their hands on the Plate. TABLE TENNIS CUP GLORY FOR NEW MILTON J! In the Annual Times and Directory Handicap Cup Final, New Milton J represented by Plamen Petrov, Mike Roberts (captain) and Adam Titcombe (team pictured below) had a really tough task on their hands against Winton YMCA F (Peter Baggs, Yari Troschey and Michael Kominek). In the Bournemouth & District league, the Milton team ended up comfortably mid-table in Division 3 while Winton were run away leaders of Division 4, so it made for a very tight match. Being new to the league with unknown form it’s fair to say that Troschey’s and Kominek’s handicaps were generous as indeed was Petrov’s for New Milton. Petrov literally got the ball rolling as he quickly overhauled Baggs’ +4 start to win the first match of the evening comfortably in two straight sets 21-12, 21-15. Next up was 14 year old Titcombe against the very awkward pen-holder Troschey who was second in the winning averages in Division 4. It was virtually a “scratch” match as Troschey had a +1 start and Titcombe did well to keep in touch during the first set albeit narrowly losing 18-21. The second set was a completely different matter as Troschey kept catching the Milton youngster out of position to win 21-9 to make it 1-1. Captain Roberts had to give away a +2 start to Kominek who is top of the Div 4 winning averages, and this match was the first to go all the way to three sets. Roberts drew first blood against the much more orthodox Kominek by taking the first set 21-16 but then seemed to lose his way to drop the next two 13-21, 11-21 for Winton to lead 2-1. In another three-setter, Petrov gave away a +4 start to Troschey and lost the first set 16-21, but caught up at 8-8 in the second to eventually win it 21-17. During the decider, Petrov’s serve was called out by the opposition but this seemed to disturb Troschey more than Petrov who seamlessly corrected his serve. Troschey led 20-19 with 2 match points but Petrov won the next two points to restore parity at 2-2. In the fifth match, Roberts took the first set off Baggs 21-16 having conceded a small +1 start. It was in the second set that Roberts truly displayed his captain’s mettle as he recovered from going 12-18 down only to sensationally come back to win 21-20 to give Milton the lead 3-2. In their “scratch” match, teenager Titcombe quickly seized the initiative and comprehensively beat Kominek 21-12 in the first set but went on to lose the next two 16-21, 15-21 to make it 3-3. Next up in this thrilling nail-biter, captain Roberts (+1) heavily lost 10-21 to Troschev whom he found very awkward with his pen-holder drives down both wings. Roberts recovered well to take the next set 21-19 having worked the Winton man out and with the benefit of a late lucky net cord and an “edge”. It was nip and tuck throughout the decider but Troschev started hitting again and won 21-15 for Winton to take the lead 4-3. Milton had to win the next match to avoid crashing out of the Cup and up stepped Petrov against Kominek receiving a +3 start. Petrov really didn’t get into his stride in the first set and lost 11-21 with things looking really bleak for Milton. It looked even bleaker as Kominek had three championship points at 21-19 but Petrov won the next two points to save the match. The deciding set was a much more different matter as a slightly deflated Kominek was making more unforced errors, with Petrov winning quite comfortably 21-11 to set up a thrilling decider at 4-4. They say “cometh the hour, cometh the man” and it was on young man Titcombe’s shoulders to beat Baggs who was playing off +1. Up stepped the teenager who seemed completely unfazed by the pressure, displaying a maturity and resolve far beyond his tender years. As the decider got under way, the outcome was never really in any doubt as the much more agile youngster took the first set 21-14 then did likewise in the second to land the Cup for his team. All in all, a thrilling and entertaining Cup Final played in a very friendly, competitive and sporting manner, a brilliant advert for the sport of Table Tennis. And for young Titcombe, the world is his oyster! Good news also from the New Milton M team (Captain Stuart Burton, Taki Hall & Maggie Brown) who beat Merton F (Dave Chapman, Steve Martin & Norma Millward) 5-4 in their Plate semi-final. Hall scored a hat-trick and Burton bagged a brace, and Brown almost added one to the tally but just lost 20-21, 20-21 to Steve Martin. It could so easily have gone the other way as Burton lost the first set of the decider against Steve Martin 16-21, only to rally and take the second fairly comfortably by 21-13. It was nip and tuck throughout the deciding set but Burton just edged it 21-19 to take his delighted team into the Plate Cup Final. PROMOTION FOR NMTTC “L” TEAM! The New Milton L team was the only team from the New Milton club in action in the Bournemouth and District league last week, and they ended up in second place in Division 5 for their efforts in their last match of the season. Last week’s team was Paul Owen, Geoff Biggs, Keith Kensley and Captain Mike Melaniphy (fourth man), and they took maximum points off Bournemouth Sports P by beating them 8-2 in their own back yard. Owen came up with his second hat-trick of the campaign and was joined in his treble by Biggs, his fifth of the season. Kensley only just missed out on his own hat-trick by losing to Luke Crisp in 8-11 in the fifth and final set. There was nothing on the doubles but Meliphany and Kensley certainly played as if there were, albeit losing by 3-1. Milton’s performance against the Bourne side reflects their marked improvement in the second half of the season where they doubled their tally of wins. They lost to the Bourne 4-6 in their first encounter, beat them in their second 6-4, then improved on that with their final 8-2 victory. They also claimed bragging rights over their club mates in the M team as they won their last two encounters 8-2 having lost their first derby clash 4-6. Paul Owen (pictured above) deserves a special mention in despatches having only returned to table tennis this season after a 46 year break. All three of his opponents were above him in the winning averages, and Owen ended up with a very creditable 52%. His performance last week was all the more remarkable considering it was his first match with his new bat! Also sharing in the glory were the other two squad members Malcolm Douglas and Chris Courage, both of whom put in some very creditable performances during the season. BETTER RETURNS FROM NMTTC TEAMS! Last week, all three of the New Milton teams improved on their previous performances in the Bournemouth & District Table Tennis League this season. In Division 4, the K team represented by Mike Gent, Sid Daynes & James Harper (pictured below), forced Bournemouth Sports L to a 5-5 draw at the Grange, having lost 4-6 in their two previous encounters. 15 year old Harper and Gent bagged a brace apiece and Daynes added one more to the tally. Milton needed the doubles for a complete turn-around and Harper and Gent very nearly went and did it! The Milton pairing took the fourth set 11-8 to level things off at 2-2, but sadly lost their way a bit in the decider to lose 4-11. The M team (Stuart Burton, Taki Hall & Maggie Brown) virtually performed the same feat in Div 5. They held Bournemouth Sports M to a 5-5 draw at the Grange, having lost their two previous encounters by 3-7. Captain Burton and Ms Hall won two matches each and combined well in the doubles to secure the draw. Also in Div 5, the L team represented by Geoff Biggs, Malcolm Douglas, Paul Owen & Fourth Man Mike Melaniphy (captain) did very well to beat second-from-top Merton K 7-3 in their own back yard. Milton went 0-3 down as Merton’s star player Sam Taylor played his matches straight off as he had an early start in the morning. However, the trio won their remaining singles matches, and then Meliphany joined with Douglas to take the doubles. Bad news for the H team in Div 3 who were sweating on the result of the delayed match between Bournemouth Sports J and Ringwood C. The Bourne won as expected which means that they stay up at the expense of the Milton team. Bad news also from the G team’s match against Bournemouth Sports M in the quarter-final of the Times & Directory Handicap Plate. Milton (Terry Jenvey (captain), Rob Fagan & Chris Pusey), who normally play in Division 3, faced some tough handicaps from the Division 5 outfit and went down 1-5, Milton’s only reply coming from Fagan. NEW MILTON “M” WINS TABLE TENNIS PLATE DERBY! Three of the New Milton Table Tennis Club’s teams had made it through to Round 3 of the Annual Times and Directory Handicap Plate competition. One of the teams was assured progression into the semis as the H and M teams faced each other in a local derby. The H team represented by Les Smith (captain), Sylvia Smith (no relation) and Ian Linney, who usually play in Division 3, were up against their M team; Stuart Burton (captain), Taki Hall and Maggie Brown from Division 5. First blood went to Captain Smith as he saw off Ms Brown in two straight sets, but Ms Smith was comfortably beaten by Ms Hall playing off a start of +5 to level things off. Burton used his +8 start cannily, surprising Linney with some fast serving to put his side ahead, but Ms Smith restored parity by beating Ms Brown. That was the H’s high-water mark however as Burton and Hall won their remaining games to secure a 6-2 victory for their M team. Hat-trick hero Burton (pictured below) is looking forward to taking his team to the semi-finals, but their opponents are not yet known. The G team also made it through to Round 3, but their match against Bournemouth Sports M is yet to be arranged, as is the J team’s Cup semi-final against Ringwood B. There was also some league action last week. The A team (Umit Kaya, Paul Iliffe & John Millward) lost their re-arranged final match against Merton B 4-6, but this point was enough to leap-frog them over Bournemouth Sports C to finish fourth in the Premier, one position lower than the New Milton B team. Although the league programme has now finished for the Premier to Div 3 inclusive, there are still four weeks of matches to go for Divs 4 & 5. The already doomed K team (Sid Daynes, Mike Gent & James Harper) lost their Div 4 encounter with Shamrock A by 3-7, but 15 year old Harper distinguished himself with his second hat-trick of the season to spare his team’s blushes. Div 5 saw the L team (Malcolm Douglas, Geoff Biggs & Keith Kensley) do well to hold third-placed Merton J to a 5-5 draw, having lost 3-7 in their two previous encounters this season. Douglas and Biggs bagged a brace apiece and Kensley chipped in with the one win, making it 5-4 up going into the doubles, with Milton sniffing victory. Douglas & Biggs won the first set 11-7, narrowly lost the second 10-12 having established a good lead, but went on to lose the next two 7-11 & 9-11 to say goodbye to the win. Div 5 also saw the M team playing their second match in a week following their successful Plate exploits. Fielding exactly the same team (Stuart Burton, Taki Hall & Maggie Brown) against table-toppers Bournemouth Sports N, bottom-placed Milton lost for third time against the Bourne, this time by 3-7. Pleasingly, all three Milton players recorded a win – it could even have been a brace for captain Burton but he tantalisingly lost to Bournemouth star Will Sherlock 13-15 in the fifth and final set. That would have been a real “scalp” for the ever improving Burton as Sherlock has only lost 2 games all season. SIX TABLE TENNIS TITLES FOR NEW MILTON PLAYERS! A fortnight of table tennis tournaments concluded with the Grand Finals Night of the Bournemouth and District Annual Individual Championships at the Grange School, Somerford, last Friday night. Four players from the New Milton Club took part in the Finals, with three of them going home with titles. Octogenarian Brian Bickell broke a Bournemouth & District record by being the first player ever to win all four of the Vets titles. 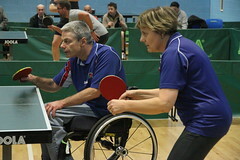 In the Vets 40+ final he avenged his defeat by Bournemouth Sports’ player Louie La in the Division 1 semi-finals by depriving him of a second title. The Vets 50+ saw him narrowly defeat fellow Div 1 player Ian Brown from Broadstone in a gruelling match that went all the way to five sets. However, he had easier victories against fellow Div 1 player Ian Robertson (Merton) in the Vets 60+ and Vets 70+ finals, seeing him off in three straight sets in both matches. This tops last year’s performance in which he “only” won the Vets 60+ and Vets 70+ titles. The Junior Under 15 final was a repeat of last year’s match between Milton’s Jack Trafford (Premier) and Matt Stanfield (Div 1) from Bournemouth Sports, with Trafford coming out on top again. Whereas Trafford disposed of Stanfield in three straight sets in last year’s final, the Bourne youngster took him right down to the wire this year, Trafford just edging it 13-11 in the fifth and final set. For the second year running, the Div 5 title was won by a New Milton player, this year it being Taki Hall, playing in her first Bournemouth tournament. Her opponent, Marina Scott (Bournemouth Sports) gave Hall a really good run for her money, coming back to win the second set 11-9 after losing the first 5-11. Hall then narrowly won the next two sets 14-12, 11-9 to secure the title. New Milton’s Terry Jenvey did well to make it through to the Div 3 final, but he faced a very tough opponent in the shape of southpaw Howard Lewis from Bournemouth Sports. The result went the way of the form book (Lewis was second to top in the winning averages), with Jenvey losing in three straight sets, having put up a good fight. New Milton Table Tennis Club’s General Secretary Bev Scott-Johns was honoured with a prestigious Torch Trophy Trust Award for Outstanding Service to Sport, presented by HRH the Duke of Gloucester. In presenting the awards, the Duke of Gloucester said “Volunteering is the lifeblood of the United Kingdom and it’s an honour to reward people who give up so much of their time and their energy for others. I hope that they act as an inspiration to those people around them”. The awards were presented at the 55th Annual Torch Trophy Trust Awards ceremony at the Army and Navy Club, Pall Mall, London, and Bev was accompanied by Club Treasurer & Press Officer Malcolm Floyd who had nominated him, Club Development Officer Shaun Newcomb and fellow team member Simon Golding who kindly arranged the transport. The Torch Trophy Trust is a charity that rewards and supports volunteers in sport and recreation, and recognises the achievements of some of the UK’s most outstanding volunteers in the annual Torch Trophy Trust Awards, presented by a member of the Royal Family. This year, the Trust recognised 21 outstanding volunteers across sport, so Bev was amongst a very select few. 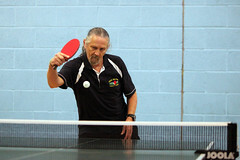 “In all, Bev has served New Milton Table Tennis Club and the sport faithfully for over 30 years. During his tenure as General Secretary, Bev has seen the club nearly double its membership from 35 to 65 members. Bev is also Volunteer Co-ordinator, Fixtures Secretary, Tournament Organiser, Team Captain, Team Player and General Factotum. Bev has also put in stints as Minutes Secretary and Honorary Treasurer. Bev has also been instrumental in nurturing youngsters and it is no exaggeration to say that he has dedicated a goodly part of his life to the sport. Bev continued to work tirelessly for the club, even after losing devoted wife Valerie to a long and debilitating illness. In fact, he made it clear that continuing to involve himself was a welcome distraction. Bev is a qualified First-Aider, Table Tennis England Tournament Organiser and County Umpire. In addition to captaining and playing in the local Bournemouth and District League, Bev plays in the Poole Pairs, Merton Summer Pairs, Ringwood Summer League, Annual Individual Tournaments and plays socially at the Wednesday Morning Club at Merton. 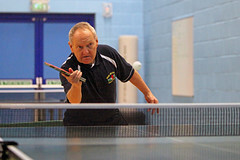 Bev is the face of New Milton Table Tennis Club, and it has often been said that they would need at least three different people to replace him, if he were ever to give up”. Sir Trevor chuckled as he read out that bit, which was echoed warmly by those present. After the ceremony, Bev said “I felt quite honoured and proud and it was a wonderful evening which went very well”. Then it was quickly back to the grindstone the following day to organise the Club’s Annual Tournaments.